This work reports the synthesis and the characterization of amorphous CoxSiyOz thin films prepared by magnetron sputtering from a single cathode. Porous layers with outstanding electrochromic properties are obtained at room temperature in one step by performing the deposition at a glancing angle configuration. The electrochromic behavior of these layers in a basic aqueous medium was dependent on the Co/Si ratio in the films and in all cases was characterized by a fast response, a high coloration efficiency and a complete reversibility after several hundred cycles. 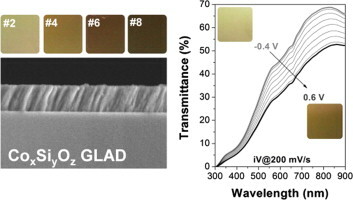 A characteristic feature of these electrochromic layers is that, for a similar thickness, the range of transmittance modulation can be tuned by changing the Co/Si ratio in the films and, specifically for films with a high concentration of silicon, to change their aspect from an almost transparent to a full colored state.